Awesome! If you're here, then you're considering renting Abby's Lake House. We know that you'll have a great time at our lake house. We look forward to hearing from you. All of our forms are in PDF format. You will need Adobe Acrobat Reader to view the documents. If you do not have Adobe Acrobat Reader, you can download it and use it for free - click here. Note: You may not need all of the documents below. Please review the document descriptions before downloading. Everyone renting Abby's Lake House needs this form. Please review it. All guests in your party that are 18 years old and older need to read, initial, and sign the agreement. This allows us to be sure that all of the adults know the rules. If you want to book, we will email you a copy of the actual form to print out and sign. What's the difference between this and our sample here? Well this sample does not have the actual address, which we only release to guests. We do this to maintain the safety and security of the property and our guests. Download Sample lease agreement in PDF format. The Pet Addendum is only needed if you have been directed by Clay or Lori (Homeowners) to use it. All pets are accepted on a case-by-case basis. So if you want to bring your pet but haven't received approval, please contact us, now. Download pet addendum in PDF format. Abby's Lake House is a beautiful place. To keep it that way, we have some rules and policies that must be followed. Also the lawyer said it would be wise to include a few other things too. What we have below are the "common speak" rules. The document spelling out these rules in detail is our Lease Agreement. To see the complete Lease Agreement with all its legalese, view the (above) of our Sample Lease Agreement. Check in: 6 pm, unless prior arrangements are made with the homeowners. Check out: 11am, unless prior arrangements are made with the homeowners. Payment: An advance payment equal to 50% of the rental rate is required when the reservations are made. The advance payment will be applied toward the rent. Credit cards, Paypal and personal checked are accepted. The advance payment is not a damage deposit. The balance of rent, pet fee (if applicable) and damage deposit are due fifteen (15) days before your arrival date. No damage is done to house or its contents, beyond normal wear and tear. All debris, rubbish and discards are placed in refuse containers outside, and soiled dishes are placed in the dishwasher and cleaned. One load of laundry is started (lines or towels). All keys are left in the designated place and the house is left locked (all doors). Any charges accrued during the stay are paid prior to departure (including additional services). No Early check in or late check out unless written approval is obtained from owners. All doors to both garages are closed and locked prior to departure. The renter was not evicted by the owner (or representative of the owner), the local law enforcement, or the Lake Association. Cancellations: A sixty (60) day notice is required for cancellation. Cancellations that are made more than sixty (60) days prior to the arrival date will incur no penalty except if deposits were made via credit card. Cancellations that are made within sixty (60) days of the arrival date forfeit the 50% reservations deposit. Cancellations that are made less than fifteen (15) days prior to arrival forfeit the entire rental amount. For any cancellations, the damage deposit and pet fee (if applicable) will be refunded. Early departure does not warrant any refund of rent or deposit unless specified in section 17 Utilities and Breakdowns. Maximum Occupancy: The maximum number of guests for Abby's Lake House is limited to eight (8) persons. An additional charge ($150 per person) and eviction of Lessee and Lesee's party for guests in addition to eight (8) may be assessed if no advance arrangements are made with Lessor. In addition, exceeding this at any time without prior notification will result in your party being asked to vacate the property immediately with no refund. Minimum Stay Requirement: This property requires a three (3) night minimum stay. If a rental is taken for less than three days, the guest will be charged the three-night rate. Include Fees: Rates include a one-time linen and towel setup. Cleaning: While linens and bath towels are included in the house, daily maid service is not included in the rental rate. Brightly colored beach towels are provided for lake and outside use. We do not permit white towels (bath towels) or linens to be taken outside the house. Snow removal from in front garage and house is provided. Removal of snow on walkways with provided snow shovel is the responsibility of the Lessee. If excessive cleaning is required or generally left in such a state that one person cannot clean it in four (4) hours, an additional cleaning fee will be deducted from your damage deposit. Rate Changes: Rates subject to change without notice. However, once a reservation is accepted (including deposit received), the rate for that reservation is guaranteed. Parking: Garage parking is limited to two (2) vehicles. Vehicles are to be parked in designated parking areas only: inside garage, in front of garage, or in front of house. Parking between the house and the lake is not permitted. Storm Policy / Road Conditions: No refunds will be given for storms. 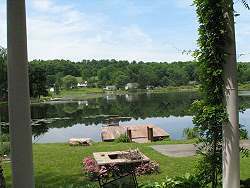 Abby's Lake House is located on a hardtop road and the garage parking is very close to the road. Roads are well maintained, however we highly recommend four wheel drive and/or chains during the snow months. We do not refund due to road conditions. Insurance: The Lessee assumes the responsibility of obtaining his own insurance for damage, theft, loss of personal property, injury or death while on said premises for himself and his or her guests. Abby's Lake House is privately owned; the owners are not responsible for any accidents, injuries or illness that occurs while on the premises or its facilities. The Homeowners (Lessors) are not responsible for the loss of personal belongings or valuables of the guest. By accepting this reservation, it is agreed that all guests are expressly assuming the risk of any harm arising from their use of the premises or others whom they invite to use the premise. Telephone: The Lessee agrees to pay all International telephone calls placed on Abby's Lake House telephones. Local and domestic long distance calls are included in rent. Cellular service is spotty in rural areas. Our local cellular provider is Verizon and works at the lake house. Other providers may or may not have coverage at the lake. Pet Policy: Pets are accepted on a case-by-case basis and are permitted on the premises only with prior approval and signing of the Pet Addendum. Utilities and Breakdowns: The Lessor will provide electric, water, heat, trash removal, basic telephone, TV service and Internet access. In the event of an extended electrical power outage and the Lessee wishes to vacate the premises early, a prorated refund will be provided. The Lessee assumes the obligation of informing the Lessor of any breakage or malfunction or failure to operate within a reasonable period so that repair can be ordered. The Lessor will repair any other household item at the earliest possible time without any compensation due the Lessee. Lessee agrees to permit repairpersons to enter premises. Inspections: Lessee agrees to let Lessor or Lessor's representatives enter the property at reasonable hours to inspect or repair. Lessor will give Lessee 24 hours notice of date, time and reason for the visit. In case of emergency, Lessor may enter property without notice. If Lessee is not there, Lessor will tell Lessee who, when and why a visit was made within 24 hours of the visit. Sublet: Lessee may not let, sublet or assign this lease for all or any part of the premises. Access: Access to the porch attic, potting shed and garage loft is restricted. No other areas are locked for safety reasons, such as access to shut off valves for gas and water. Guests are asked to confine themselves to livable areas. Lessee is responsible for missing items from the home pending inspection. Extras: The televisions, DVD players, gas grill, fireplace, window air conditioners, canoe, kayak, sailboat, etc (everything beyond beds, bath and kitchen items) are referenced as "extras", and are supplied at no extra charge as a convenience for the Lessee and guests to use. Should any "extras" breakdown or malfunction, the Lessor shall not be held accountable nor shall the rental fee be renegotiated. However, upon notification, the Lessor will attempt to address the issue promptly. Written Exceptions: Any exceptions to the above mentioned policies must be approved in writing in advance.